Newborns and children up to age 2 are welcome to join our Mommy and Me (Daddy and Me) class which is similar to a Kindermusik class, but in French or Spanish. Watch the look of wonder and delight on your babies face while listening to songs in a foreign language (and participating in dances and marches while in Mommy's or Daddy's arms). Toddlers up to age 2 also love joining in and toddling along with the rest of us as we sing, dance, march and do finger plays. Parents are asked to stay for this program. Preschoolers, ages 2 to 4, will enjoy two hours of French or Spanish immersion, with native speakers. Thanks to your child's uncanny ability to absorb languages, he will understand almost everything said in the classroom within months. Read more about our preschool classes on our curriculum page. Elementary and middle school students will enjoy one hour of foreign language every day. These are semi-immersion classes which include singing, art, skits, and fun, out-of-seat games. We teach the spoken language only, in the lower grades. This way, children are more likely to develop a native accent. In the upper elementary grades, we slowly introduce the written language and simple conjugations. Middle Schoolers use books from the Practice Makes Perfect series. 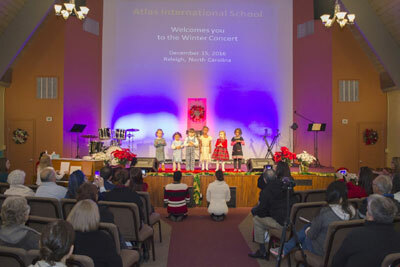 All children, grades PreK to 8, enjoy participating in two concerts per year, singing songs and/or performing skits in Spanish and French, in addition to playing violin and/or Piano. This contributes greatly to your child's confidence over the years! Give your child the gift of bilingualism!